Available from Sunday 24 February, 2002 at 10:00am. Salome for Today, Tosca for Tomorrow - please do not miss this luxurious occasion, as this serves you with the following special pricing. To order tickets, please call +81-3-5352-9999 at the Box Office, +81-3-5237-9999 at the Ticket PIA, or +81-3-5749-9911 at the E-plus. *Only on February 24th (the opening day that operates this special service), the number of tickets purchased will be limited to 4 sets. *Other special services (students, the elderly, the disabled, or family service) are inapplicable to this service. Tosca, the most dramatic of Puccini's operas, features a succession of touching arias and portrays the hero and heroine pathetically yet beautifully as they are subjected to harsh destiny. The celebrated singer Tosca's aria "Vissi d'arte, vissi d'amore" and Cavaradossi's song of farewell "E lucevan le stelle" never fail to move the listeners even if listened to hundreds of times. Furthermore, the magnificent and beautiful stage setting is an attraction in itself. 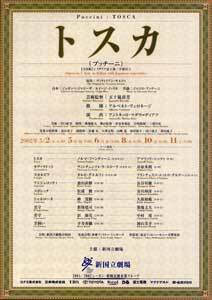 An upgraded version of this dazzling opera, which adorned the opening of the 2000/2001 season of the New National Theatre, Tokyo, will be presented again.